Recently we have picked up the last 20 releases of the ccMiner SPMOD fork for Maxwell and tested them on a Gigabyte GTX 970 WF3 GPU. running at stock frequencies to see what has happened with the hashrate in the X11, Quark, NeoScrypt and LyraREv2 algorithms. There were users that wanted us to repeat the same test with a GTX 750 Ti GPU, so we have picked up an eVGA GeForce GTX 750 Ti video card and repeated the same tests. The first version we tested with ccMiner 1.5.53-git SP is from early July and looking at the results it seems that the most notable improvement is with Quark as well as some slight improvement with X11. Lyra2REv2 support has been added in release ccMiner 1.5.60-git SP, so there are no results prior to that, it seems however that the initial versions and the last one have pretty much the same hashrate with some drop with some in-between versions. The NeoScrypt hashrate hasn’t changed much, there is some slight variance with different versions probably due to the Boost frequency of the GPU variating a bit. 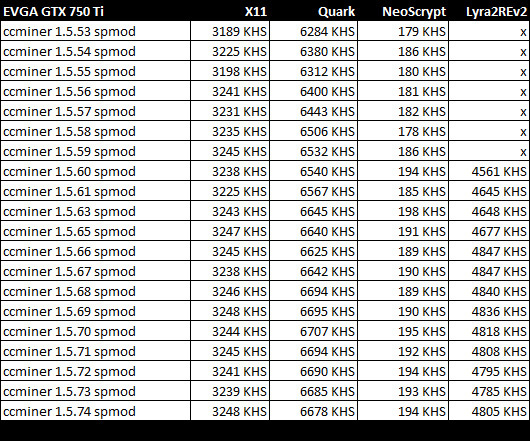 Do note that these are results with publicly available and open source code, there could be some higher performance private miners also available and you might be able to squeeze more performance with different intensity settings (other than the default ones) as well as by overclocking the video card.